Mick on the new album cover | The Glorious (uk) - A loud rock band of two. Chris & I were seeking a symbol that embodied life as we knew it in Manchester, which we hope is reflected in the sounds & the songs on the new album “Afflecks Palace”; And Afflecks Palace in the heart of Manchester City was the epicenter of all things new & changing, culminating in a sub culture of incredible music & street fashions. 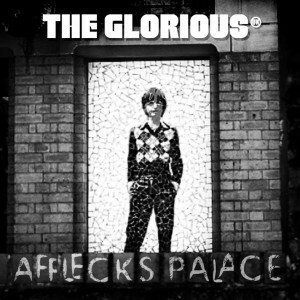 And then, Chris came up with a brilliant design & title for the album “Afflecks Palace”. He showed me the art work & I knew immediately this was it. Chris has a great eye for all things cool.